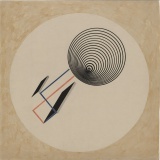 El Lissitzky, Proun 99, water-soluble and metallic paint on wood, 129x99cm, 1924. 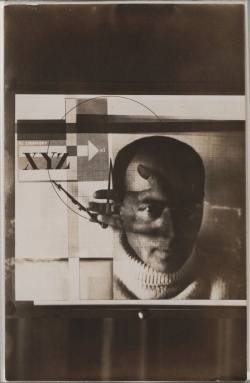 El Lissitzky (1890-1941) was an artist, designer, photographer, typographer, polemicist and architect. He was an important figure of the Russian avant-garde, helping develop suprematism with his mentor, Kazimir Malevich, and designing numerous exhibition displays and propaganda works for the Soviet Union. His work greatly influenced the Bauhaus and constructivist movements, and he experimented with production techniques and stylistic devices that would go on to dominate 20th-century graphic design. Born Lazar Markovich (El) Lissitzky (Ла́зарь Ма́ркович Лиси́цкий) in 1890 to an educated middle-class Jewish family in Pochinok, Smolensk Province, Russia. He grew up in Vitebsk, a small Jewish town in Belorussia, where he took art lessons in 1903 from Russian painter Iurii (Yehuda) Moiseevich Pen, who also taught Marc Chagall. In 1909, after being turned down by the St. Petersburg Academy of Art, Lissitzky left Russia for the first time to enroll at the Technische Hochschule in Darmstadt, Germany, where he studied architectural engineering. During his studies, in 1912 he traveled in Germany and also to France and Italy, but was forced to return to Russia during the summer of 1914, after the outbreak of World War I. He enrolled as a student of engineering and architecture at the Riga Polytechnical Institute [Rizhskii politekhnicheskii institut], temporarily quartered in Moscow, and received his diploma on 3 June 1918 with the degree of engineer-architect. In 1915-16 he worked in various architectural offices in Moscow and St. Petersburg. In 1916 Lissitzky became deeply involved in a Russian national movement to create a revival of Yiddish culture for modern Russian Jews. With the artist Issachar Ryback, he set off on an expedition organized by the Jewish Historical and Ethnographic Society [Evreiskoe istorichesko-etnograficheskoe obshchestvo] to study and record the ornamentation and inscriptions in synagogues located along the Dnieper River. Following the February Revolution of 1917, Lissitzky moved from Moscow to Kiev where he devoted himself to the illustration of Yiddish books, especially for children, and organised and submitted work for exhibitions of Jewish art in Moscow. In early 1919, he helped found the publishing house Kultur-Lige, which became a leading force in the dissemination of Yiddish culture in Ukraine. Toward the end of his stay in Kiev, Lissitzky worked for the art section of the local branch of IZO Narkompros. 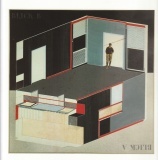 Lissitzky's move in July 1919 from the relative isolation of the Bolshevik-controlled city of Kiev back to Vitebsk brought with it a shift in focus from Yiddish culture to architecture and book design. At the invitation of Marc Chagall, Lissitzky began a new position teaching architecture, graphic arts, and printing at the Vitebsk Popular Art Institute. 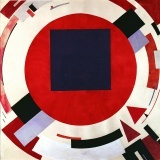 In September, he was joined by Kazimir Malevich, whose system of nonobjective art, suprematism, inspired Lissitzky to take up painting and to invent his own form of abstract art, which he named Proun [Proekt utverzhdenia novogo; Project for the Affirmation of the New] in 1920. Propaganda also became a more overt part of Lissitzky's artistic mission at this time; during the civil war, he worked in the suprematist collective UNOVIS [Affirmers of the New Art] as a designer of agitational posters meant to incite workers back to the factory benches and to rally Jews around Bolshevism. After disagreements between Chagall and Malevich led to the disbandment of the Institute in 1921, Lissitzky returned to Moscow to teach architecture at the newly established VKhUTEMAS. This was a period of great artistic ferment and debate in Moscow. Lissitzky's arrival coincided with the emergence of the radical First Working Group of Constructivists, which advocated a utilitarian and socialist platform of art for industry. 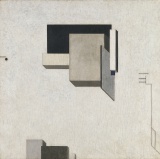 In September 1921, at INKhUK, Lissitzky put forth his own program in an important lecture, outlining the connections between suprematist painting and the principles of space and construction in his Proun works. In December 1921, Lissitzky left Russia for Berlin, by way of Warsaw, dispatched by the Soviet government to establish cultural contacts between Soviet and German artists. In 1922 he collaborated with the Russian writer Ilya Ehrenburg on producing two issues of the short-lived periodical Veshch/Objet/Gegenstand; met the typographer Jan Tschichold who became his life-long friend. 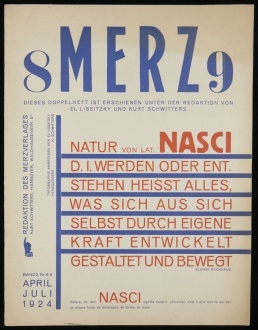 In May 1922 Lissitzky participated in the Congress of International Progressive Artists in Düsseldorf; followed by the Congress of the Constructivists and Dadaists in Weimar in September, where he met the Dada artist Kurt Schwitters. He had a minor role in setting up the First Russian Art Exhibition in Berlin in October, when he also met Sophie Küppers, who had been the artistic director of the Kestner Society in Hanover, founded by her recently deceased husband Paul Erich Küppers to support and promote the German avant-garde. In December 1922 he delivered an important lecture in Berlin on Soviet art, the next year followed by the lectures in Rotterdam, Utrecht, The Hague and at the Kestner Society. 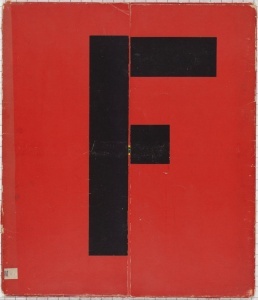 In 1923, Lissitzky also shortly joined the editorial board of Hans Richter’s journal G; became a member of the De Stijl group; and joined ASNOVA (Association of the New Architects), an organization founded in Moscow by Nikolai Ladovsky, Nikolai Dokuchaev and Vladimir Krinsky, assuming responsibility for developing connections with foreign architects. In October 1923 he was taken ill with acute pneumonia, a few weeks later diagnosed with pulmonary tuberculosis, and in February 1924 relocated to a sanatorium near Locarno, Switzerland, where, with the help of his future wife Sophie, he produced publications and photographs at a remarkable pace: edited the architectural review ABC: Beiträge zum Bauen with Dutch architect Mart Stam and Swiss architect Emil Roth; produced advertising designs for Gunther Wagner's Pelikan office supply company; and with the technical help of Roth, began work on the Wolkenbügel [Cloud Iron], a horizontally expanding skyscraper intended for the Nikitsky Square in Moscow. In November 1924 the Swiss authorities turned down his request to renew his visa, but grant him a six-month extension "on humanitarian grounds." In June 1925 Lissitzky returned to Moscow via St Petersburg. In January 1926 he was appointed head of the Department of Furniture and Interior Design for the wood and metal workshop at VKhUTEMAS. Later in June he received assignment from Narkompros to travel to Dresden, Rotterdam, Utrecht, Hamburg, and Lübeck to study modern architecture. In Germany, he was commissioned by the directorate of the International Art Exhibition in Dresden to design the Raum für konstruktive Kunst [Room for Constructivist Art] (1926), and by Alexander Dorner to design the Kabinett der Abstrakten [Abstract Cabinet] for the Provinzialmuseum (Sprengel Museum) in Hanover (1927–28). In collaboration with Ladovsky, Lissitzky published the single issue of the architectural review ASNOVA in Moscow, 1926. By 1927, with the success of his design for the All-Union Printing Trades Exhibition in Moscow, Lissitzky had became a much sought-after propagandist for the Stalinist regime, realising the Soviet Pavilion at the International Press Exhibition in Cologne (1928), the Soviet Room at the Film and Photo Exhibition in Stuttgart (1929), the Soviet Pavilion at the International Hygiene Exhibition in Dresden (1930), the Soviet section at the International Fur Trade Exhibition in Leipzig (1930), and the Gorky Park of Culture and Rest in Moscow (1931). 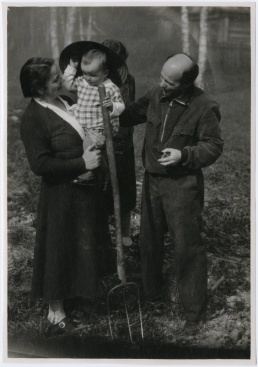 On 27 January 1927 Lissitzky married Sophie Küppers; his son, Jen, was born on 12 October 1930; and the next year Sophie’s older sons come to Russia to live with her and Lissitzky in the village of Khodnya, thirty miles from Moscow. During a 1928 vacation in Austria and Paris Lissitzky met Piet Mondrian, Fernand Léger and Le Corbusier. In 1932 Lissitzky signed his first contract with the editors of USSR im Bau [USSR in Construction], a Soviet propaganda publication intended for Western audiences and published in Russian, English, German, and French; became one of the principal artists for the journal, along with Aleksandr Rodchenko, Varvara Stepanova, and Solomon Telingater; designed seventeen issues, ten of them in collaboration with Sophie Küppers. In 1934 he was appointed chief artist for the Agricultural Exhibition of the Soviet Union in Moscow. During 1935-36 Lissitzky was frequently hospitalized; convalesced in a sanatorium in the Caucasus. In 1940 he was appointed chief artist for the Soviet Pavilion at the Belgrade International Exhibition, a project left unfinished due to the outbreak of World War II. 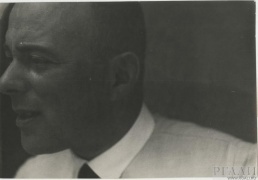 In 1941 he worked on anti-Nazi posters and other war-related projects until his death in Moscow on 30 December. Lissitzky in his studio, Vitebsk, 1919. Stedelijk. The Constructor, 1924 (printed 1985). Based on his self-portrait from 1914. Gelatin silver print from the original glass plate negative on Agfa paper. 20x22cm (40,5x30,5cm). With Kazimir Malevich, Study for Backcloth for Vitebsk Committee for the Struggle against Unemployment, 1919. Prounenraum [Proun Room], Great Berlin Art Exhibition, 1923. Description. Stedelijk. Proun 1A (Bridge), 1919. Gouache. 8,5 x 15 cm. Private coll. Stedelijk. Proun 1C, 1919. Oil and metal foil on plywood. 68 x 68 cm. Thyssen. Stedelijk. Proun 1E (City), 1920. Stedelijk. Preliminary drawing for a project commemorating Rosa Luxemburg, 1919-20. Gouache, ink, and pencil on paper. 10 x 10,1 cm. Costakis. Proun 14 with Truncated Four-sided Pyramid, 1919. Pencil, gouache and watercolour on paper. 24.7 x 23 cm (sheet). Proun 2C, 1920. Oil, paper, and metal foil on plywood. 59,5 x 39,8 cm. Stedelijk. Proun 4 B, c1920. 70 x 55.5cm. Thyssen. Proun 5 A, 1923. Oil on canvas. 81 × 60 cm. Proun 5-A, 1919. 22 x 17.5 cm. Thyssen. Stedelijk. Study for "Proun" 8 Stellungen, 1923. Watercolour and gouache over graphite on laid paper. 24.5 × 24.8 cm. Proun P23, No. 6, 1919. Tempera on canvas. 62,9 x 77,5 cm. Van Abbemuseum. Proun Interpenetrating Planes, 1919-20. Oil on canvas. 81 x 59 cm. KM Moritzburg Halle. Proun, 1920. Collage of various cut-and-pasted papers, including abrasive paper (prepared with gouache and silver metallic paint), on cream wove paper, laid down on tan laminate board. Proun 30, 1919. Oil on cardboard. 49,5 x 39,5 cm. KM Moritzburg Halle. Untitled, c1919-20. Oil on canvas. 79.6 x 49.6 cm. Guggenheim. Proun, c1921. Gouache, watercolour, brush and ink and pencil on paper. 14 × 14.6 cm. Proun, c1921-23. Gouache, chalk on paper. 46,7 x 39,5 cm. Van Abbemuseum. Proun Composition, c1922. Gouache and ink on paper. 50.2 x 40 cm. MoMA. Proun 19D, 1920-21. Gesso, oil, varnish, crayon, colored papers, sandpaper, graph paper, cardboard, metallic paint, and metal foil on plywood. 97.5 x 97.2 cm. MoMA. Proun 43, c1922. Watercolour, gouache, india ink, aluminium paint, collage, on board. 66.8 x 49 cm. Tretyakov. Untitled (Proun), 1922-23. Gouache over pencil. 5 × 23 cm. Proun, c1922-23. Gouache and pencil on paper. 22.9 x 28.7 cm. Proun GK, c1922-23. Gouache, ink, and pencil on paper. 65.6 x 50.0 cm. MoMA. Proun 93: Free-Floating Spiral, c1923. Graphite and colour pencil, india ink, pen and gouache. 49.9 x 49.7 cm. Proun G7, 1923. Tempera, varnish and graphite on canvas. 77 x 62 cm. First Kestner Portfolio: Proun, print no. 3, 1923. Lithograph. 64 x 49 cm. Proun (Project for Progress), 1924. Gouache, pencil on paper. 52 × 50 cm. Van Abbemuseum. Proun 99, 1924. Water-soluble and metallic paint on wood. 129 x 99 cm. Proun, 1924-25. Collage of various cut-and-tipped wove papers (prepared with gouache, graphite, and varnish), and brush and pen and black ink, with red watercolor, on cream laminate cardboard. 49,8 x 65 cm. Artic. Proun, 1924-25. Pen and ink, watercolour, collage. 64.6 x 49.7 cm. Proun. Gouache and graphite on paper. 28.7 x 22.9 cm. Proun. Gouache on paper. 28.7 x 22.9 cm. Left to right: agitational structures by Nikolai Simon, Gustav Klutsis, and El Lissitzky. Composition. Gouache and pencil on buff paper. 39 × 29 cm. Soccer Players, c1926. Gelatin silver print. 13.7 x 11.2 cm. Russian State Archive of Literature and Art (RGALI) in Moscow possesses the most extensive collection of Lissitzky's work. Its documentary holdings on Lissitzky include a photomontage; a plan of the first skyscraper in Moscow (1924-1928); a poster of Lenin; twelve experimental photos (1920s); photos of exhibitions in Berlin and Leipzig designed by Lissitzky; various articles; a notebook of Lissitzky's with sketches and miscellaneous notes; assorted letters to Lissitzky; his birth certificate, school diploma, contracts and applications; materials on his work with the Association of New Architects; individual photos of Lissitzky (between 1922-1935); group photos with others (between 1928-1934); and two photos of Gorky taken by Lissitzky in 1928. There is a searchable CD-ROM version (1996) of the seven-volume print guide to this collection. The Lissitzky collection at Moscow's Tretyakov Gallery consists of drawings, watercolours, lithographs, archival documents, photographs, and examples of Lissitzky's original book designs and illustrations. Of the more than 300 items, outstanding examples include his variant designs for exhibition catalogues and periodicals; covers for film scenarios; sketches, drafts, and variants of his Prouns; watercolours and drawings of costume designs; and many sketches, studies, and preparatory materials for unrealized architectural projects and exhibition pavilions. 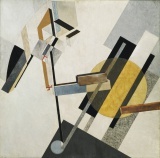 The Lissitzky collection at Van Abbe Museum in Eindhoven consists of 130 artworks (most of which came from the artist's studio in Hanover) and is the largest outside of Russia. The Museum also possesses several archival documents relating to El Lissitzky (postcards and letters, all to architect J.J.P. Oud, dating between April 28, 1923 and December 26, 1928). Unpublished catalogue. The Busch-Reisinger Museum at Harvard University, Boston, has a moderately-sized collection (41 items) consisting of drawings (12), prints (21) and books (8), with a good number of Proun images. The Sprengel Museum in Hanover has a small collection comprised of sketches and drafts for the Abstract Cabinet, several Proun lithographs, and a few entries by Lissitzky in the 84-page guestbook of Käte Steinitz, 1920. Rijksbureau voor Kunsthistorische Documentatie in The Hague has letters from Lissitzky to the Dutch architect and artist Theo Van Doesburg, and from Lissitzky and Kurt Schwitters to Til Brugman (all dating between 1922 and 1926). Fondation Le Corbusier in Paris has three letters from 1924 between Le Corbusier and Lissitzky. Suprematisch worden van 2 kwadraten in 6 konstrukties, 1922, PDF, JPGs. 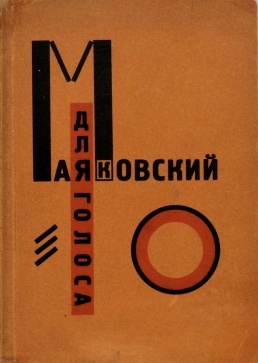 Mayakovsky, Lissitzky, Dlya golosa, 1923, PDF. 1o Kestnermappe Proun, 1923, PDF, JPGs. Figurinenmappe: Sieg über die Sonne, 1923, PDF, JPGs, JPGs, JPGs. Merz 2(8/9): Nasci, eds. Lissitzky & Schwitters, Apr-Jul 1924, PDF, JPGs. 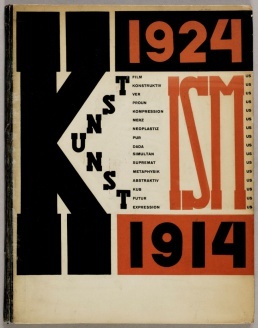 Lissitzky, Arp, Die Kunstismen/Les Ismes De L'Art/The Isms of Art: 1914-1924, 1925. 48 p., 26.5 × 24.5 cm. PDF (64 MB), Log, JPGs. Had gadya [The Only Kid], Warsaw: Kultur lige, 1919,  pp, JPGs; facsimile repr., ed. Arnold J. Band, intro. Nancy Perloff, Getty Research Institute, 2004, 42 pp. illustrated version of the traditional Passover song Had gadya. (Yiddish) Review: Greisman (Eye 2004 EN). 1o Kestnermappe Proun [Proun. 1st Kestner Portfolio], 1923, 6 plates, JPGs. A suite of lithographic prints made as a New Year gift for members of the Kestner Gesellschaft, an independent society based in Hanover, which arranged exhibitions of contemporary art. Lissitzky had had a successful exhibition at the society early in 1923 and was commissioned to produce these prints. Figurinenmappe: Sieg über die Sonne [Figurines: Victory Over the Sun], Hanover: Leunis & Chapman, 1923, JPGs, JPGs, JPGs. The drawings recasting the Russian Futurist opera Victory Over the Sun (1913/20) as an electromechanical show with mechanical puppets. Preface. "Suprematism in World Reconstruction" , trans. in Lissitzky-Küppers, El Lissitzky, 1968, pp 327-330; repr. with notes in Russian Art of the Avant-Garde: Theory and Criticism, 1902-1934, ed. John E. Bowlt, Viking Press, 1976, pp 151-158. From a typescript in the Lissitzky archives. The essay acts as a retrospective commentary on Malevich's original formulation of suprematism and advances a far wider concept with its emphasis on such ideas as visual economy and the universal application of suprematism. "Topography of Typography", in Lissitzky-Küppers, El Lissitzky, 1968, p 359. 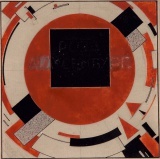 "A. and Pangeometry", in Lissitzky-Küppers, El Lissitzky, 1968, pp 352-358; repr. in El Lissitzky, Russia: An Architecture for World Revolution, Cambridge/MA, 1970, pp 146-149; repr. in Art in Theory 1900-1990, eds. Charles Harrison and Paul Wood, Blackwell, 1992, pp 303-307. Эль Лисицкий / El Lissitzky. Schau der Arbeit 1919–1923, Moscow/Berlin, 1924. Cover. El Lissitzky, Eindhoven: Stedelijk van Abbemuseum, 1968. Nisbet, Peter, ed. (1987). 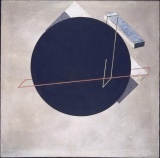 El Lissitzky, 1890-1941. Cambridge, MA: Harvard University Art Museums, Busch-Reisinger Museum. El Lissitzky, 1890-1941: Retrospektive, ed. Norbert Nobis, Frankfurt am Main: Ullstein, 1988, 310 pp. For an exhibition at Sprengel Museum Hannover, Jan-Apr 1988. El Lissitzky and Alexander Dorner: Kabinett der Abstrakten – Original and Facsimile, Berlin: Museum of American Art, 2009, 32 pp. 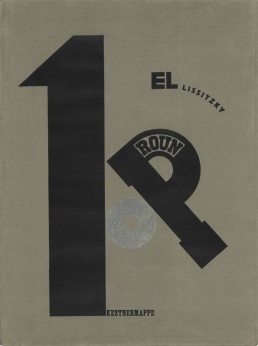 El Lissitzky: Life, Letters, Texts, intro. Herbert Read, trans. Helene Aldwinckle and Mary Whittall, London: Thames and Hudson, 1968, 407+284 pp; 2nd ed., rev., New York, 1980. Incl. 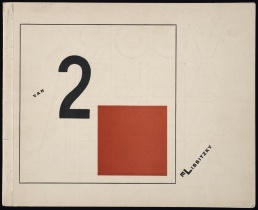 23 Lissitzky's articles and statements from 1920-29. Review: Lindsay (Art Bulletin 1972). Margarita Tupitsyn, El Lissitzky: Beyond the Abstract Cabinet: Photography, Design, Collaboration, New Haven/London: Yale University Press, 1999, 239 pp. Reviews: Railing (Art Book 2000), Machmut-Jhashi (H-Russia 2001). Perloff, Nancy Lynn; Reed, Brian, eds. (2003). Situating El Lissitzky: Vitebsk, Berlin, Moscow. Getty Publications. TOC, . Nancy Perloff, "The Puzzle of El Lissitzky's Artistic Identity", pp 1-23. Christina Lodder, "El Lissitzky and the Export of Constructivism", pp 27-46. Éva Forgács, "Definitive Space: The Many Utopias of El Lissitzky's Proun Room", pp 47-75. Maria Gough, "Constructivism Disoriented: El Lissitzky's Dresden and Hannover Demonstrationsräume", pp 76-125. John E. Bowlt, "Manipulating Metaphors: El Lissitzky and the Crafted Hand", pp 129-152. Leah Dickerman, "El Lissitzky's Camera Corpus", pp 153-176. Margarita Tupitsyn, "After Vitebsk: El Lissitzky and Kazimir Malevich", 1924-1929, pp 177-195. 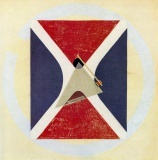 T. J. Clark, "El Lissitzky in Vitebsk", pp 199-210. Peter Nisbet, "El Lissitzky circa 1935: Two Propaganda Projects Reconsidered", pp 211-234. 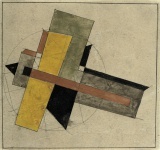 Ernő Kállai, "El Lissitzky", De Cicerone 6:22 (November 1922), pp 1058, 1063. Trans. Helene Aldwinckle and Mary Whittall, in Lissitzky: Life, Letters, Texts, 1980. Traugott Schakher, "El Lissitzky", Gebrauchsgraphik 5:12, 1928. Lucia Moholy, "El Lissitzky", The Burlington Magazine 108:756 (March 1966), pp 160-161+163. Alan C. Birnholz, "Notes on the Chronology of El Lissitzky's Proun Compositions", The Art Bulletin 55:3 (September 1973), pp 437-439. Steven Mansbach, Visons of Totality: Laszlo Moholy-Nagy, Theo Van Doesburg, and El Lissitzky, University of Michigan Press, 1978. Yve-Alain Bois, Christian Hubert, "El Lissitzky: Reading Lessons", October 11: "Essays in Honor of Jay Leyda", Winter 1979, pp 113-128. Benjamin H. D. Buchloh, "From Faktura to Factography", October 30 (Autumn 1984), pp 82-119. Esther Levinger, "El Lissitzky's Art Games", Neohelicon 14:1, 1987, pp 177-191. Esther Levinger, "Art and Mathematics in the Thought of El Lissitzky: His Relationship to Suprematism and Constructivism", Leonardo 22:2 (1989), pp 227-236. Manuel Corrada, "On Some Vistas Disclosed by Mathematics to the Russian Avant-Garde: Geometry, El Lissitzky and Gabo", Leonardo 25:3/4, Visual Mathematics: Special Double Issue, 1992, pp 377-384. Paul Galvez, "Self-Portrait of the Artist as a Monkey-Hand", October 93, 2000. Igor Dukhan, "El Lissitzky: Jewish as Universal: From Jewish Style to Pangeometry", Ars Judaica, 2007, pp 1-20. Alexandra Shatskikh, Vitebsk: The Life of Art, Yale University Press, 2007. Seth L. Wolitz, "El Lissitzky", The Yivo Encyclopedia of Jews in Eastern Europe, c2010. John G. Hatch, "Some Adaptations of Relativity in the 1920s and the Birth of Abstract Architecture", Nexus Network Journal 12:1, 2010, pp 131-147. Maria Gough, "Contains Graphic Material: El Lissitzky and the Topography of G", in G: An Avant-Garde Journal of Art, Architecture, Design, and Film, 1923-1926, eds. Detlef Mertins and Michael William Jennings, Getty Publications, 2010, pp 21-52. Klaus Pollmaier, "El Lissitzky's Multilayer Photographs: A Technical Analysis", in Object:Photo. Modern Photographs: The Thomas Walther Collection 1909-1949, eds. Mitra Abbaspour, Lee Ann Daffner, and Maria Morris Hambourg, New York: Museum of Modern Art, 2014. Maria Gough, "Lissitzky on Broadway", in Object:Photo. Modern Photographs: The Thomas Walther Collection 1909-1949, eds. Mitra Abbaspour, Lee Ann Daffner, and Maria Morris Hambourg, New York: Museum of Modern Art, 2014. Alan C. Birnholz, El Lissitzky, Yale University, 1973. Ph.D. dissertation. Kemal Reha Kavas, Architectural Form Generation in Suprematist Painterly Space: The Significance of El Lissitzky's Prouns, Middle East Technical University, 2005, 120 pp. Master Thesis. Lissitzky Foundation, c/o Van Abbemuseum, Eindhoven. Launched 2015.
demonstrationsraum. 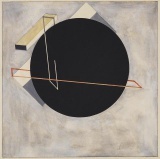 A virtual exhibition on EL Lissitzky's 'Abstract Cabinet', 2015-2017. Models of Lissitzky's reconstructions of Malevich's figures from the Victory Over the Sun opera by Henry Milner, 2009. On Lissitzky's design for a yacht club on Lenin Hills, 1925. Lissitzky's retrospective at IMMA, Dublin, 2015. This page was last modified on 26 January 2019, at 12:56. This page has been accessed 181,200 times.